the sun is light lime green. the sky is forest. the ground is reflective forest. the cube is hot pink. The cube is light. The cube is 7.5 feet wide. The cube is 7.5 feet tall. 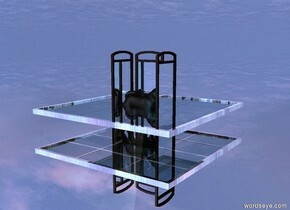 the cube is 1 foot above the ground. the compass is 10 feet above the cube. the compass is 15 feet south from the cube. the cube is facing the compass. the fern is 5 feet behind the cube. the fern is 1.9 feet west of the cube. the palm tree is 3 feet behind the cube. the palm tree is .01 foot west of the cube. [O V E R G R O W T H] is in front of the cube. 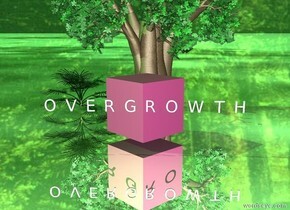 [O V E R G R O W T H] is 5 feet above the ground. [O V E R G R O W T H] is unreflective. The second green tree is 2 inches behind the cube. the sky is checkerboard. the sun is cyan. the cyan ground is rocky. the giant cyan eggplant is 100 feet in the air. 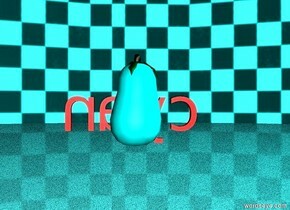 the red [cyan] is 1 inch in front of the eggplant. the sun is storm blue. the camera-light is dim cyan. the sky is a cloud. the ground is silver. the dog is dark. the dog is -1 feet below a silver window. the window is facing down. the window is glass. the mirror is behind the dog. a mirror is in front of the dog. a mirror is to the east of the dog. the mirror is facing the dog. the dim light is -1 foot below the dog.